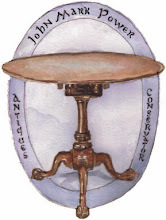 This is the second post I am writing concerning the reproduction of a hall tree dating to around 1890. 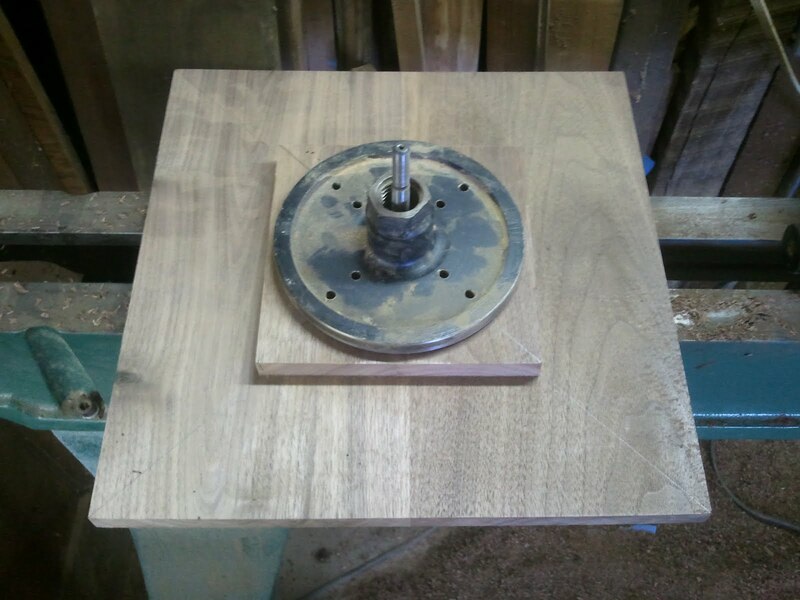 The original was made of Oak but I am making the reproduction from Walnut. The first post was concerned with the reproduction of the pediment and the lion carvings that sit on it's perch. 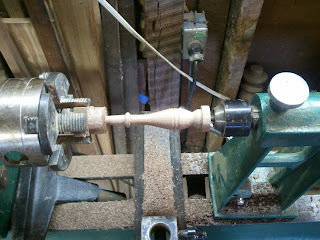 In this post I will show some of the turning and carving work as well as a some of the milling work. 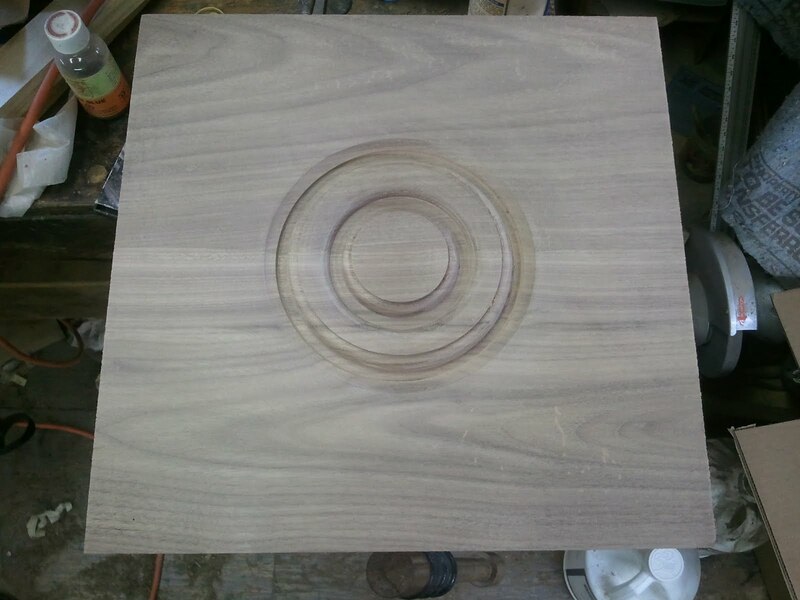 With the exception of a few panels, I was able to make the entire piece up from solid material. The panels were glued up from two boards and are used for the center raised panel, the back of the case below the seat, and the bottom of the case below the seat. 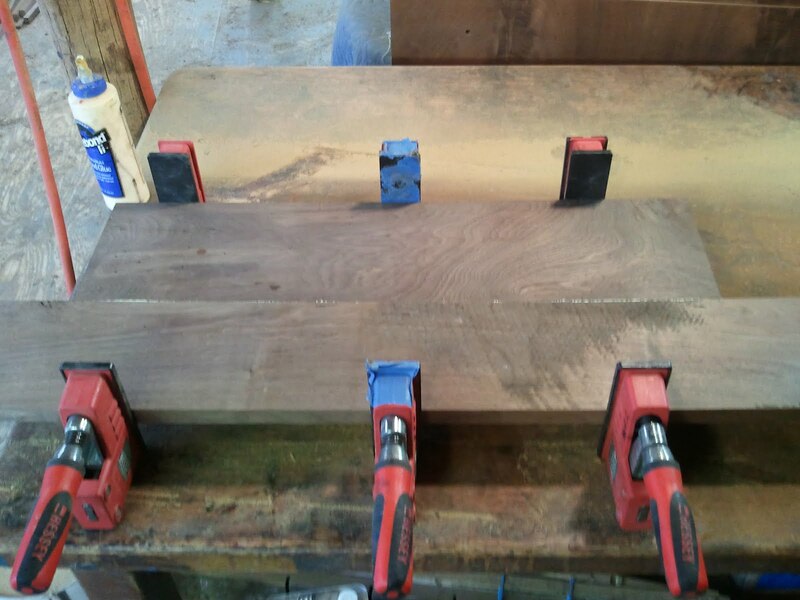 The photo below shows most of the pieces for the hall tree cut to size. 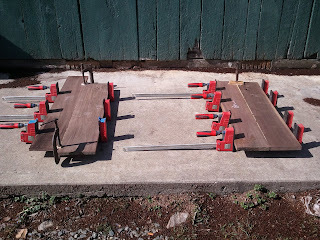 It is followed by two photos of the panels that I glued up being clamped while the glue dries. 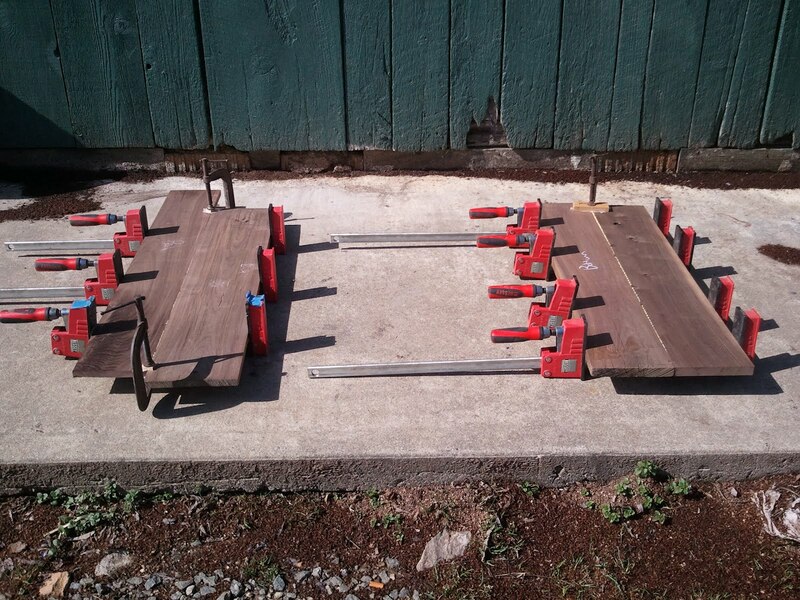 One of the nice things about this project is that it requires a diversity of skills. 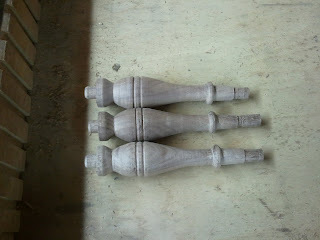 There is turning, carving, joinery, and molding involved in the reproduction. 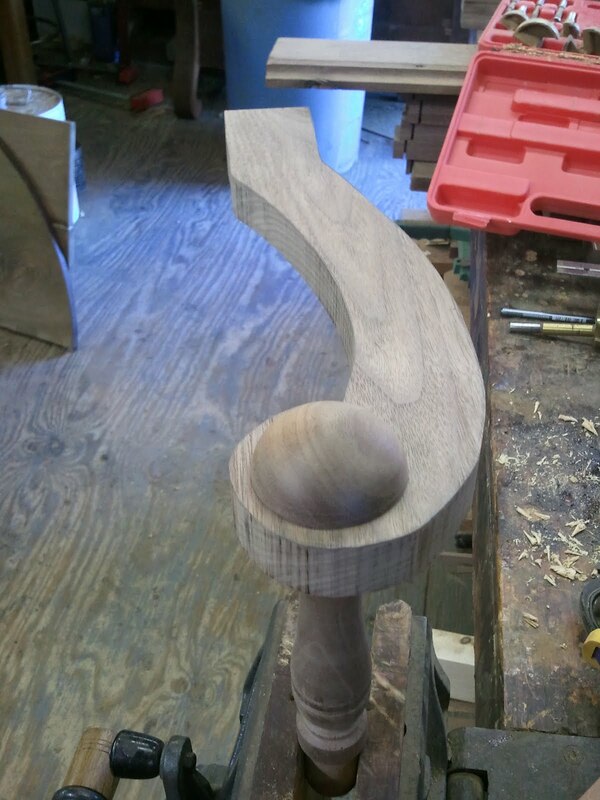 These next few photos document some of the turning that was done for the project. 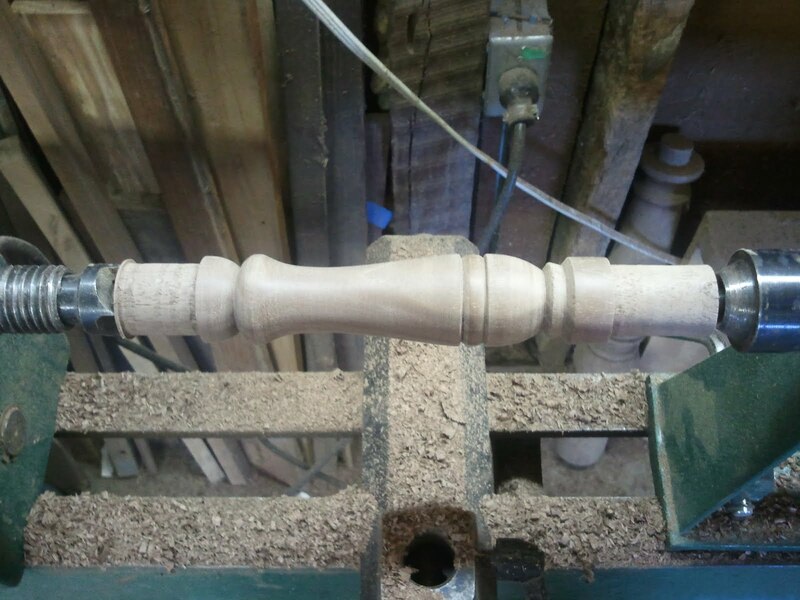 The hall tree has three vertical turnings that pierce one of the rails in the back. 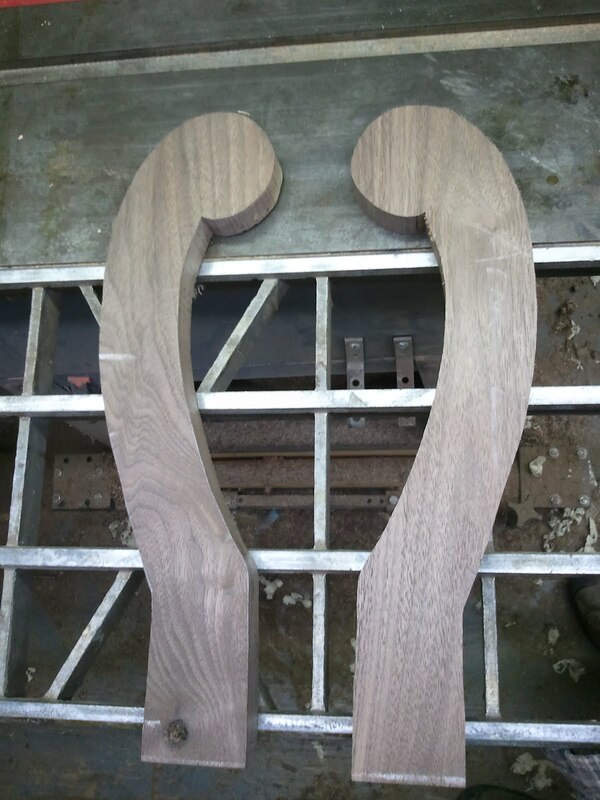 They are purely decorative. 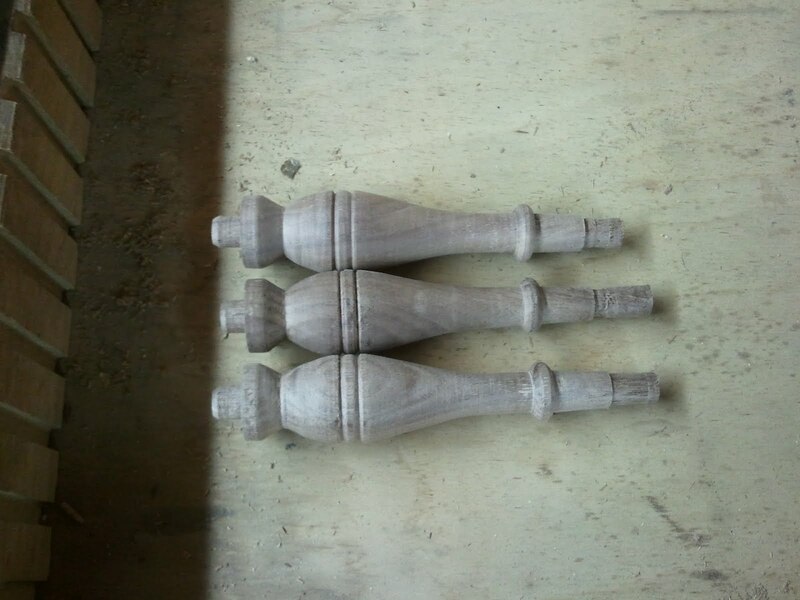 The turnings are actually made up of two different turnings which are tenoned into the rail, one below and one above. The turnings below are vase shaped and terminate with a tenon in the rail below. 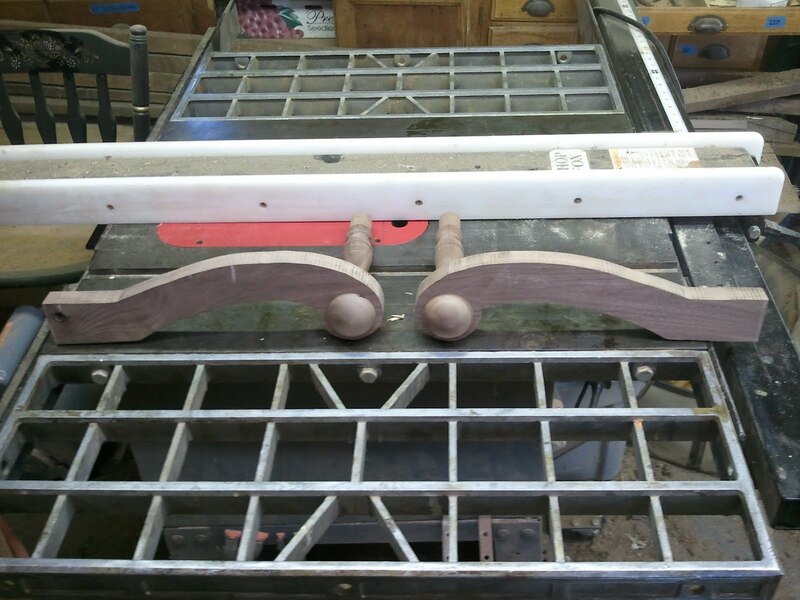 The turnings above the top rail are arrow shaped and terminate midway between rails. Below are a few photos of the bottom turnings being turned. The turning blank is chucked into the lathe and ready to turn. In this photo the blank is turned to a rough billet allowing me to mark where my cuts will be. 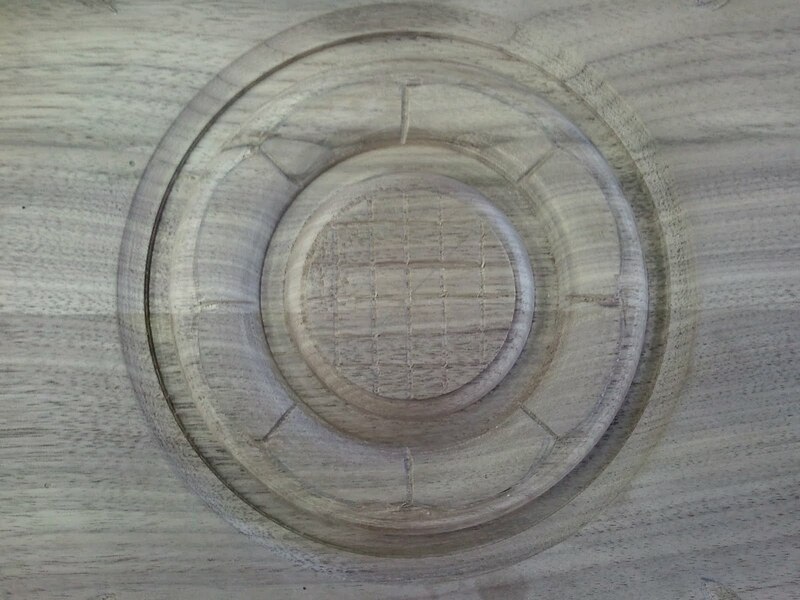 this photo was taken during the turning process. 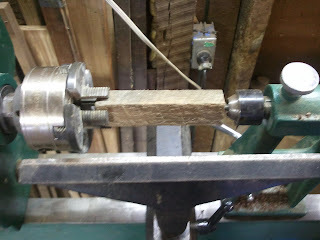 The last step before parting the turning off was to turn the tenons on either end. 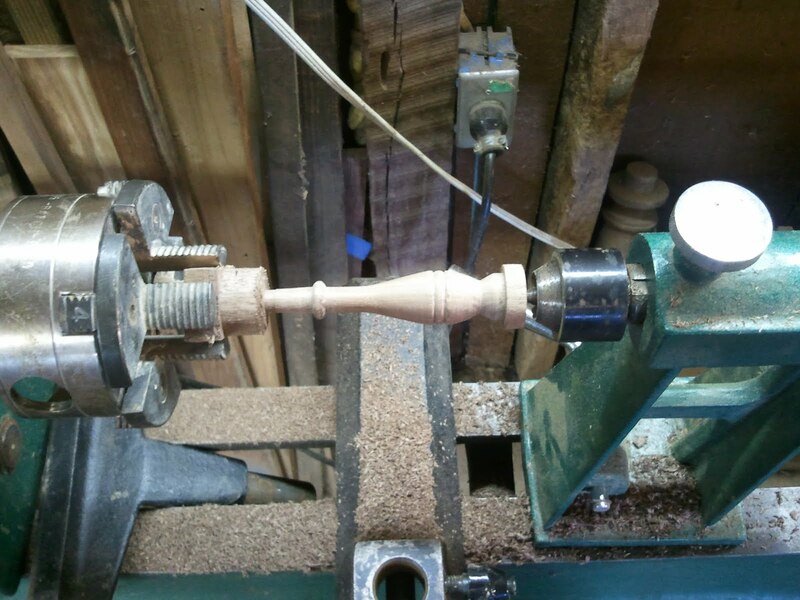 This photo shows the three turnings together. 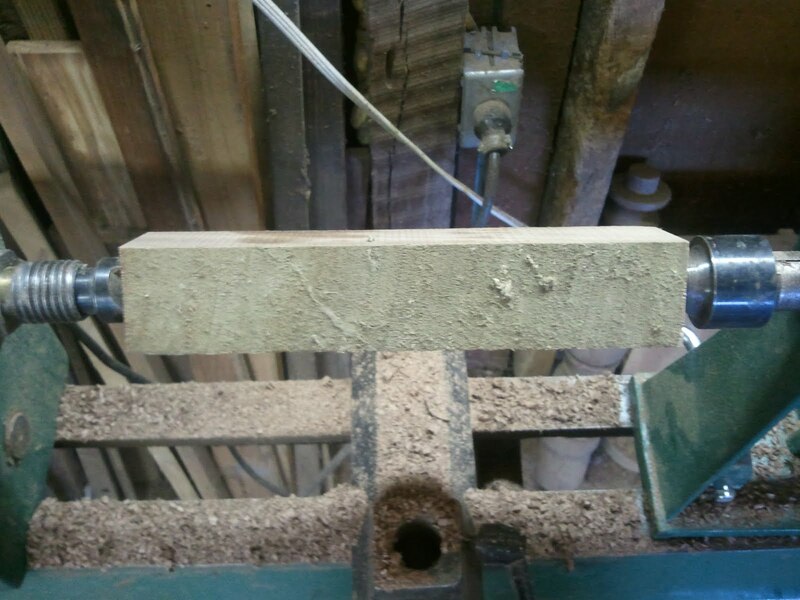 These next few photos show the turning of the arrow points above the rail. Unfortunately the photos were uploaded sideways and I cannot fix them, but you get the idea. 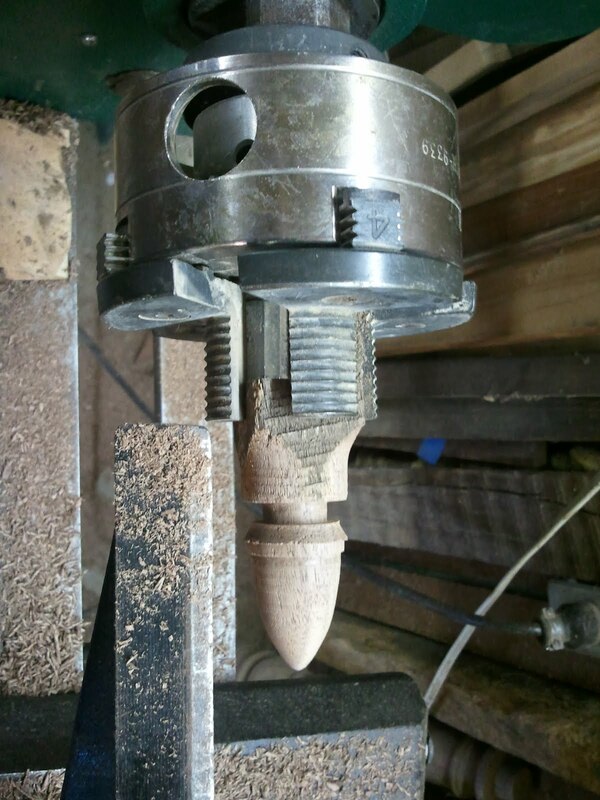 This photo shows one of the arrow heads being turned. 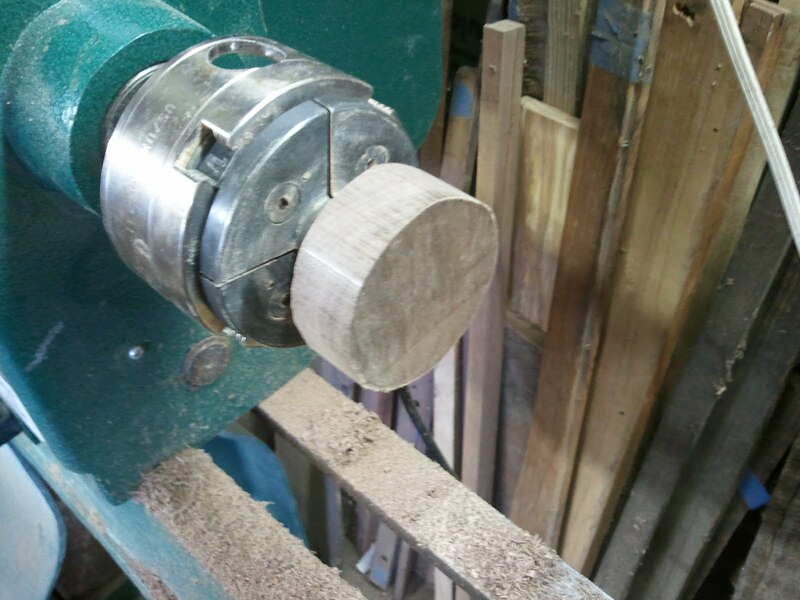 Here I am comparing one of the turnings to an original from the Oak hall tree. 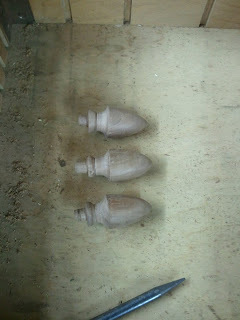 The three turned arrowhead completed. The next two photos show before and after shots of the caps that cap the arm posts on the seat. 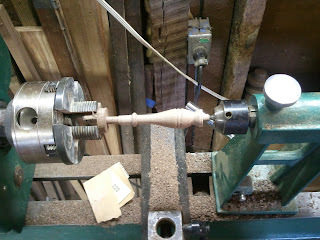 The post is tenoned through the arm and the cap covers the end of the tenon. 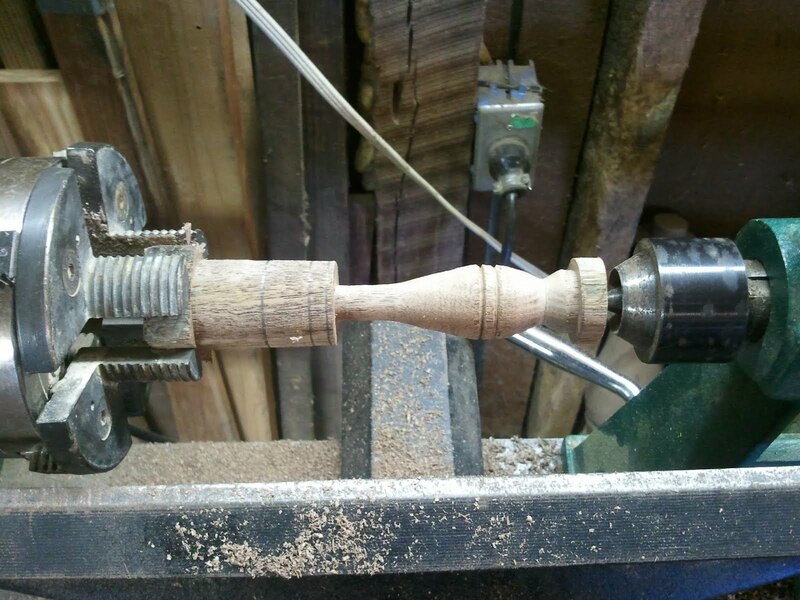 The entire assembly can be seen at the end of this post. I also turned several smaller caps which are used as decoration on another part of the hall tree. I neglected to take photos of them so I will move ahead to the arm posts. 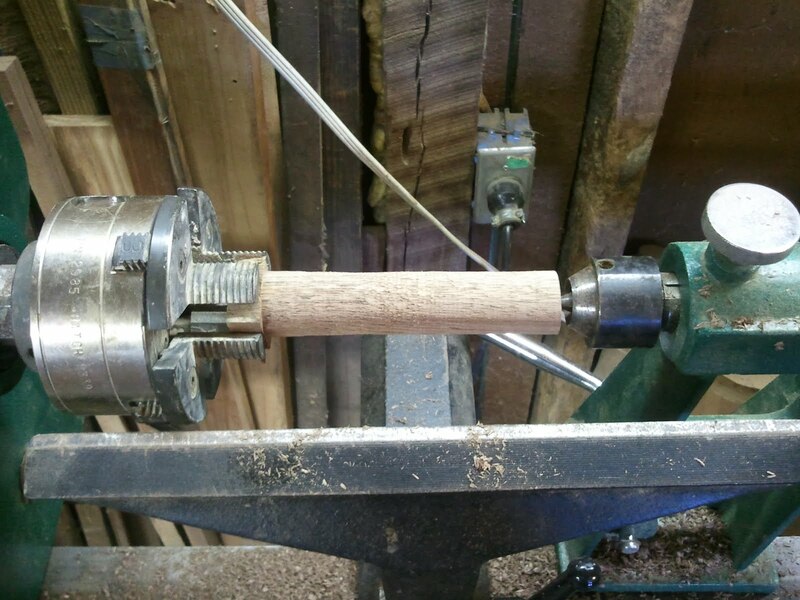 Here is a photo of the arm post blank before it was turned followed by a photo of it after it was turned. 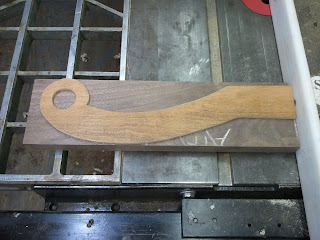 the last turning that was necessary was to decorate the center of a raised panel. 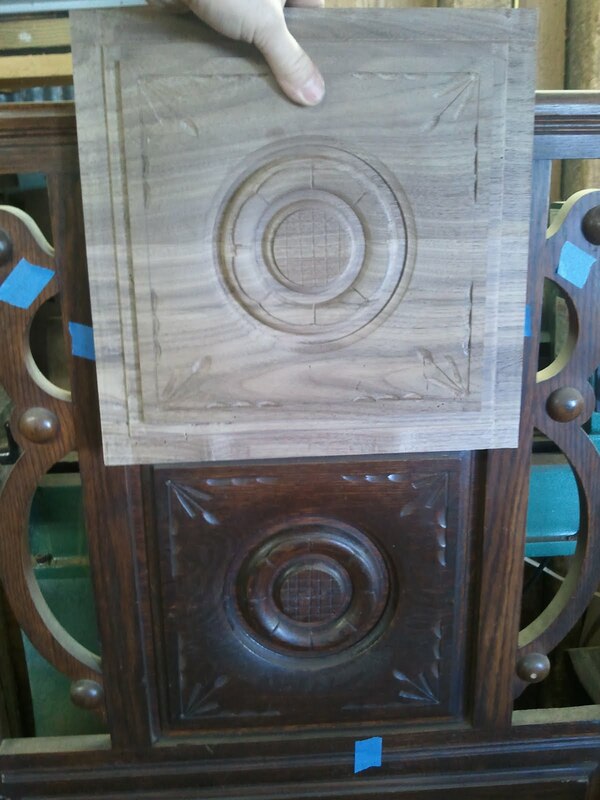 Rather than applying decoration to the panel, the original craftsman decided to turn the entire panel and then to carve it. 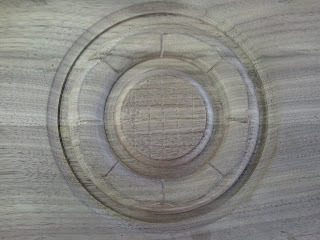 The result is a carving of a sunflower in the center flanked by cattails in each corner. 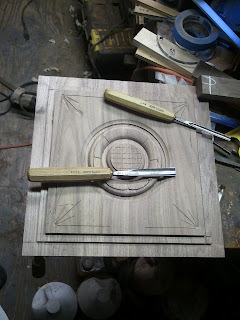 The following photos show the preparation, turning, and carving of the raised panel. 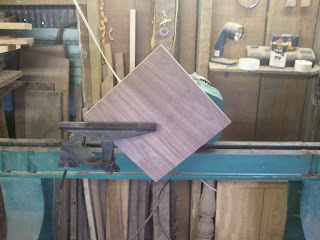 This photo shows a backing board being glued to the back side of the panel. This step was made on the original hall tree and serves the purpose of making the center carving sturdier. It also made the blank more rigid for turning. 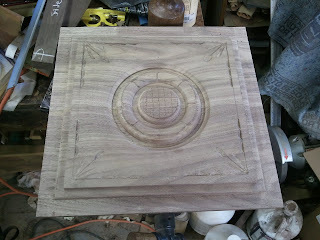 after the glue dried, I positioned the faceplate on the back of the raised panel. In the center of the faceplate is a Forstner bit I used to help center the faceplate. Once centered, the faceplate was screwed to the blank and the Forstner bit was removed. This next photo shows what the turned sections looked like after I had finished on the lathe. 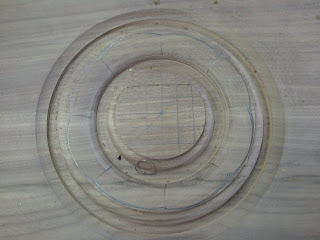 I next marked out the turned area so that I could carve the detail. 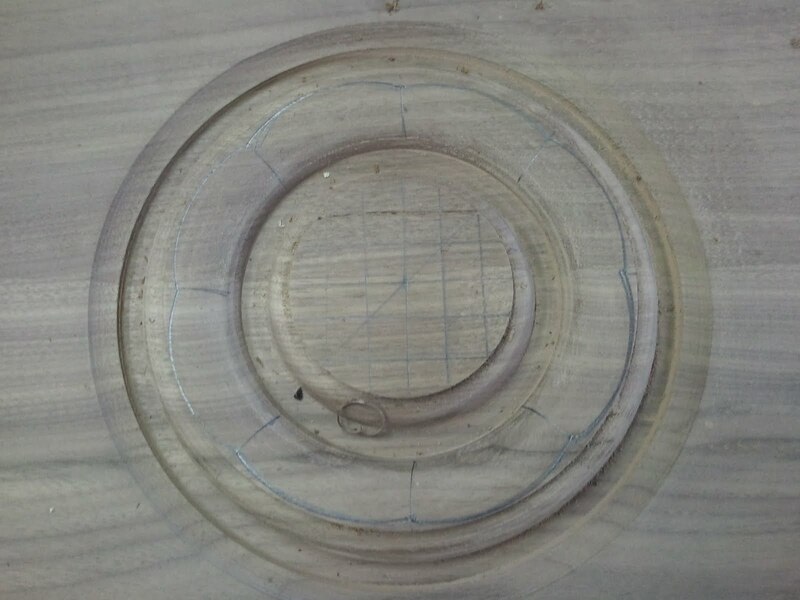 This included carving the larger circle into flower petals. 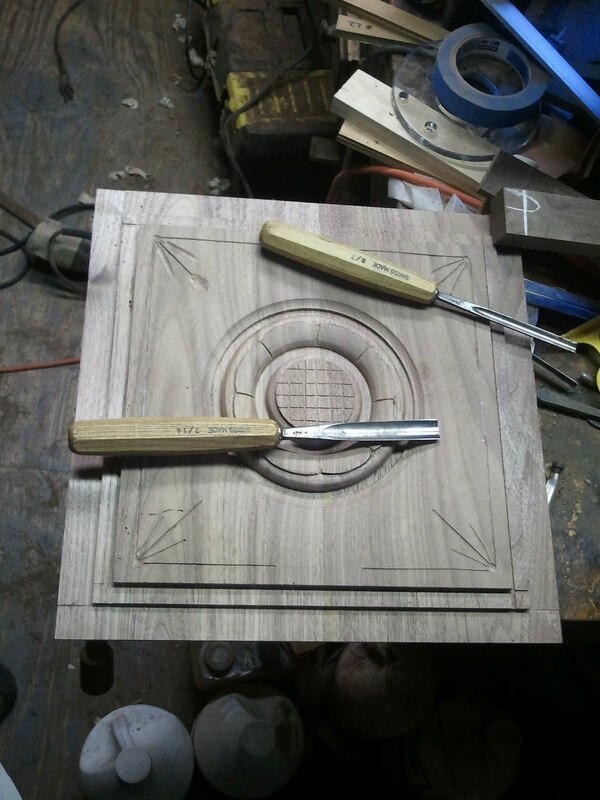 This photo was taken during the carving process. 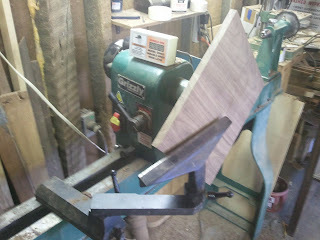 I had also cut the sides away on the table saw to create the raised panel. 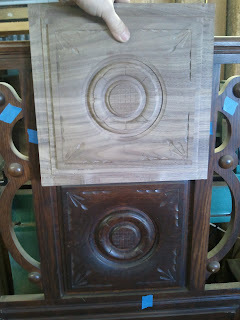 These next three photos show the completed panel. 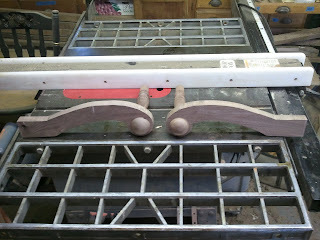 The last photo shows the new panel next to the old. 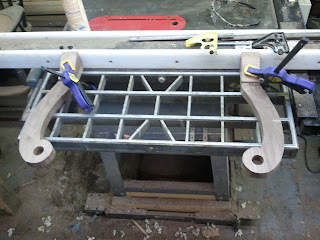 The last part I will write about in this post is the fabrication of the arms. This was fairly straight forward. 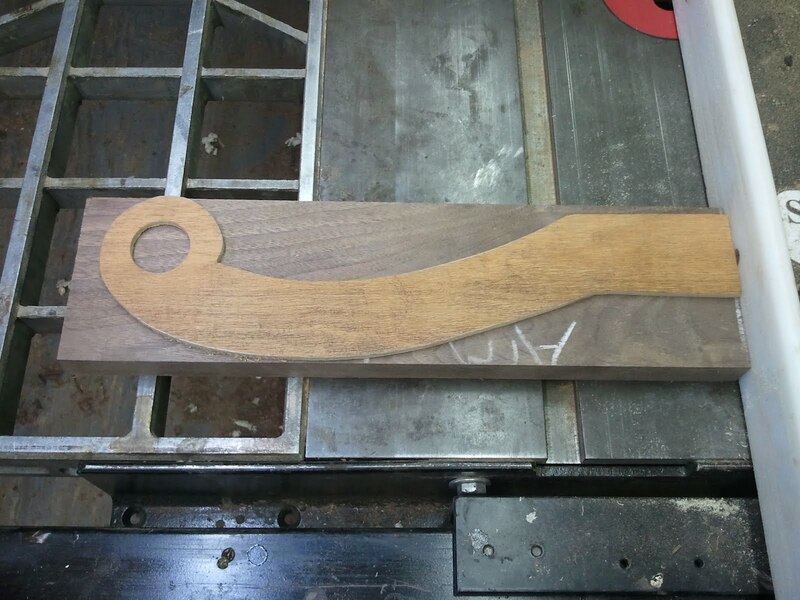 I created a template that I could use for both arms and traced it's profile onto the wood I had chosen for the arms. 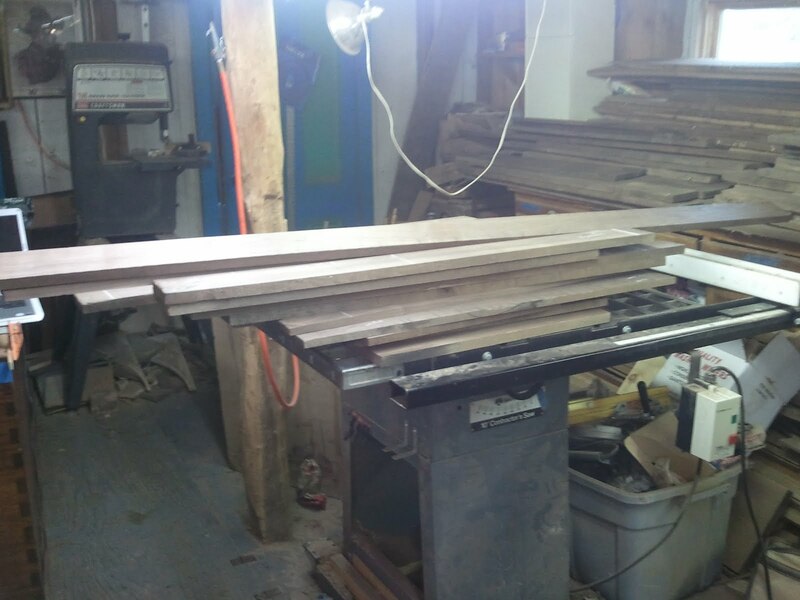 Below is a photo of the template laid out. 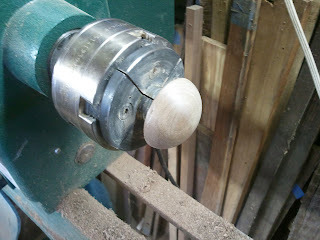 I used a Forstner bit to drill the hole so I could use it again on the actual arms to find the center for drilling. This photo shows both arms cut out before they were drilled. 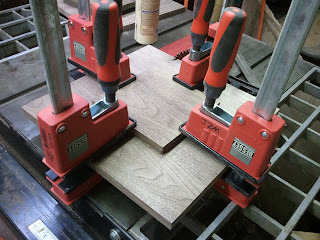 Once the hole was drilled, I assembled the arms with the arm posts and caps. 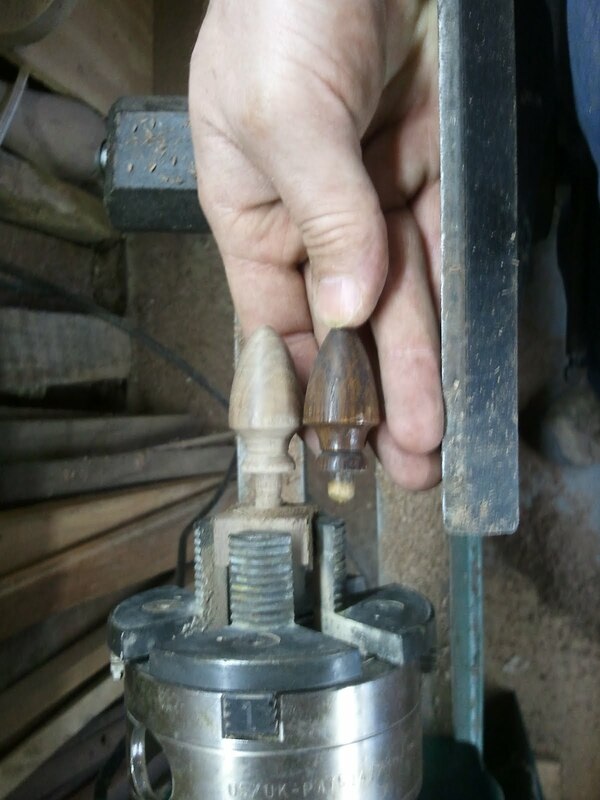 As mentioned before, the arm post has a long tenon that passes through the arm and into the underside of the cap. 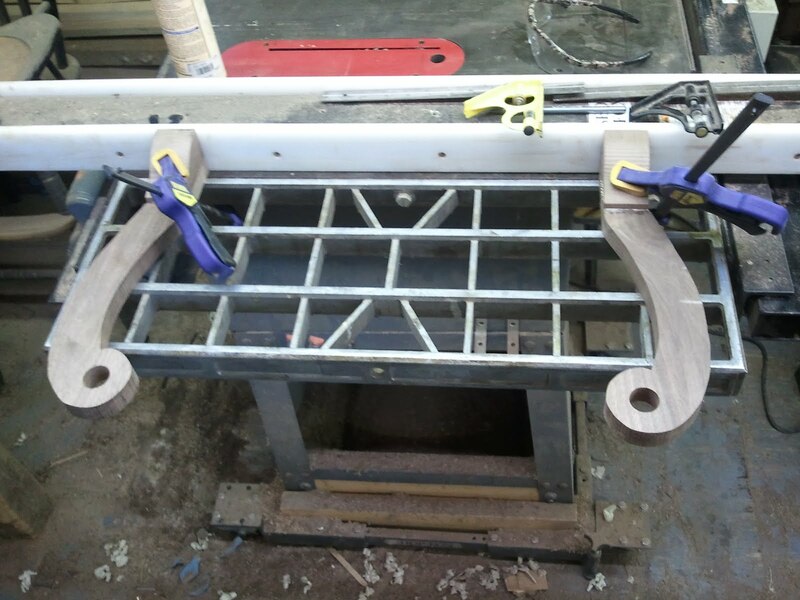 Here is a photo of the completed arm assembly followed by a photo of both arm assemblies. This last photo shows the corner blocks which transition into the back of the hall tree being glued in place. 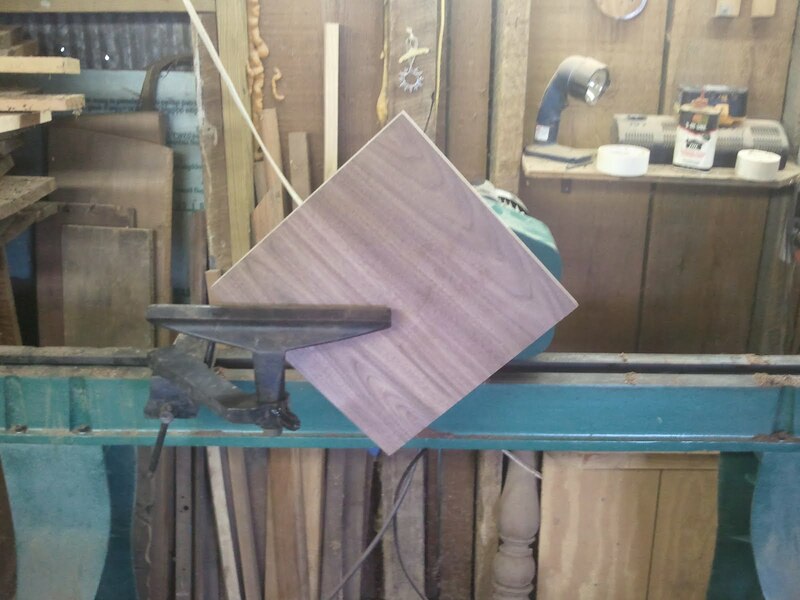 I use the table saw fence as a clamp here. 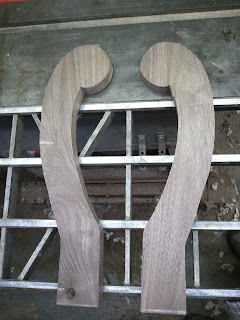 the next post will show the construction of the hall tree.